This entry was posted in Samples Submitted, Sea star RNA-seq and tagged coelomycete, Pycnopodia helianthoides, RNA, rna-seq, sea star on 14 May, 2014 by kubu4. Apparently the Bio26 sample provided on 20140428 was incorrect. Instead, the sample should have been CF26. Samples were initially flash frozen and then stored @ -80C (no preservatives used). No visible cells/tissue in all samples, except Bio 26. Samples were homogenized in 1mL TriReagent. Used the Direct-zol RNA MiniPrep Kit (ZymoResearch) according to the manufacturer’s protocol (including on-column DNase I procedure) for the remainder of the isolation. Eluted with 50uL of 0.1%DEPC-treated H2O and spec’d on NanoDrop1000. Samples were stored in Shellfish RNA Box #5. Yield and quality look great. Will pass info on to Steven and Colleen for decision on which samples to sequence. This entry was posted in Sea star RNA-seq and tagged coelomycete, Direct-zol, Pycnopodia helianthoides, RNA, RNA isolation, RNA quantification, sea star, TriReagent on 8 May, 2014 by kubu4. Samples CF 3 and CF 17 likely have insufficient total RNA for sequencing at Cornell (200ng minimum required). This entry was posted in Sea star RNA-seq and tagged coelomycete, Direct-zol, Pycnopodia helianthoides, RNA, RNA isolation, RNA quantification, rna-seq, sea star, TriReagent on 28 April, 2014 by kubu4. Performed an EtOH precipitation on the sea start RNA due to some residual column resin (?) in the tubes after elution. Added 0.1 volumes of 3M sodium acetate (pH=5.2; 10uL), 1uL glycogen (Ambion stock 5mg/mL), 2.5 volumes of ice cold 100% EtOH (275uL). Vortexed and incubated O/N at -20C. Pelleted RNA 16,000g, 30mins @ 4C. Pelleted RNA 16,000g, 15mins @ 4C. Removed supe, resuspended RNA in 50uL of 0.1%DEPC-treated H2O and spec’d on NanoDrop1000. This entry was posted in Sea star RNA-seq and tagged coelomycete, EtOH precipitation, Pycnopodia helianthoides, RNA, RNA quantification, sea star on 25 April, 2014 by kubu4. Zymoresearch support suggested putting the samples through another set of columns to help clean up the apparent phenol carryover that was seen (absorbance peak shifted to 270nm) in the initial isolation of these samples. Added 500uL of TriReagent to each sample and vortexed. Then, proceeded with the remainder of the protocol (excluding the DNase step). Eluted with 50uL of 0.1% DEPC-treated H2O and spec’d on NanoDrop1000. Absolutely horrible!! I can’t even begin to fathom what has happened here. The samples run with the sample kit all worked so well; why did this whole thing have to be jacked up with the actual samples??!! Well, I’ll do a second elution using 50uL of 0.1%DEPC-treated H2O and spec. Let’s see if that helps…. This entry was posted in Sea star RNA-seq and tagged coelomycete, Direct-zol, Pycnopodia helianthoides, RNA, RNA quantification, rna-seq, sea star, TriReagent, troubleshooting on 24 April, 2014 by kubu4. Spun samples 5000g, 20mins @ RT to pellet any cells. Discarded supe. Resuspended cells/debris in 1mL TriReagent. Disrupted cells by pipetting and vortexting. RNA was isolated using the Direct-zol RNA Miniprep Kit (ZymoResearch). RNA was DNase treated on-column, as described in the manufacturer’s protocol, using DNase I. RNA was eluted from the columns using 25uL of nuclease-free H2O and spec’d on a NanoDrop1000. So, this is disheartening. 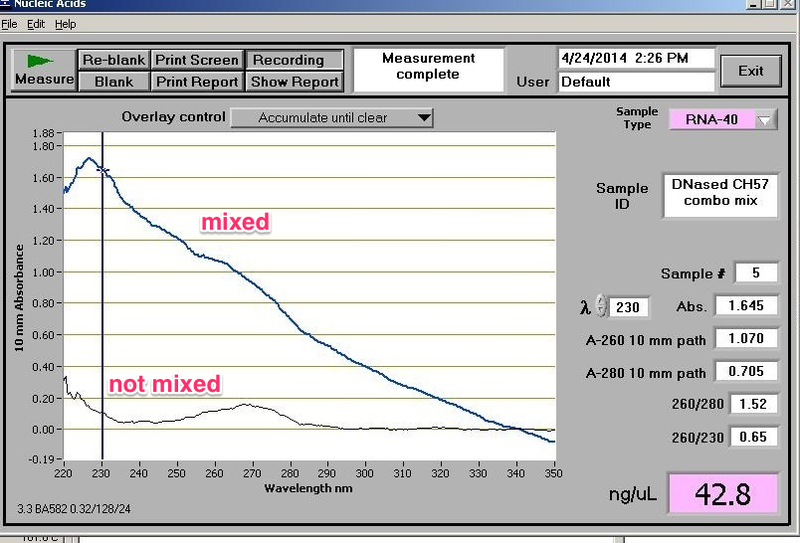 Overall, the RNA looks pretty crappy; poor 260/280 ratios and a general shift in absorbance to 270nm. Plus, the yields aren’t that great. Maybe RNA left on the column and/or some sort of contaminant pushing these readings out of whack? Although the 260/280 values are significantly better, there’s still this persistent shift of peak absorbance to 270nm. I contacted technical support for the kit and they say the absorbance shift is indicative of phenol contamination. They have advised that I add a volume of TriReagent to the RNA and re-run it through a new set of columns, following the entire RNA isolation protocol. This entry was posted in Sea star RNA-seq and tagged coelomycete, Direct-zol, NanoDrop1000, Pycnopodia helianthoides, RNA, RNA isolation, RNA quantification, RNAlater, sea star on 16 April, 2014 by kubu4. Samples were spun 5000g, 20mins @ RT. Supe was removed, being sure to leave behind any debris that failed to pellet. Samples were homogenized in 1mL of TriReagent by pipetting/vortexing. RNA was then isolated using the Direct-zol RNA Miniprep Kit (ZymoResearch). RNA was eluted from the column with 25uL of 0.1%DEPC-treated H2O and spec’d on a NanoDrop1000. RNA quality looks very good, as do the yields. I’m very surprised I got anything close to 1ug out of either sample! However, it should be noted that neither of these samples has been DNased and, as such, the yields seen above may potentially include residual gDNA carryover which would artificially inflate the yields seen above. Will DNase the samples to see how yields are affected (if at all). This entry was posted in Sea star RNA-seq and tagged coelomycete, Direct-zol, P26, P8, Pycnopodia helianthoides, RNA, RNA isolation, RNA quantification, sea star, TriReagent on 10 April, 2014 by kubu4. Tried another method of RNA Isolation for comparison with regular TriReagent method. Pelleted samples in RNAlater by spinning 5000g, 10mins @ RT. Removed RNAlater, lysed pellets in 1mL TriReagent. Split each sample equally into two tubes (500uL in each tube). Added equal volumes of 100% ethanol to each tube and vortexed. Transferred samples to spin columns and followe manufacturer’s protocol. Eluted with 25uL of nuclease-free H2O (provided in kit). Spec’d on NanoDrop1000. RNA quality is very good (based on 260/280 ratios). This turned out much better than the previous attmpt using the basic TriReagent method. However, the previous attempt (see 20140401) may have been compromised by me being too aggressive when collecting the aqueous phase. Knowing how little sample was present, I may have been overzealous in trying to gather too much of the aqueous phase, leading to the phenol carryover that was evident. Regardless, these columns seem to do an excellent job of eliminating even salt carryover, as we frequently see high absorbance at 230nm with marine samples; particularly those stored in RNAlater. This entry was posted in Sea star RNA-seq and tagged coelomycete, Direct-zol, P16, P6, Pycnopodia helianthoides, RNA, RNA isolation, RNA quantification, RNAlater, sea star, TriReagent on 2 April, 2014 by kubu4. These were “trial” RNA isolation runs to determine what yields we could expect from samples of this nature. Both samples had very small tissue/cell pellets. Tubes were spun @ 5000g for 10mins at RT to ensure all cells were pelleted. RNAlater was removed and pellets were lysed using 1000uL of TriReagent, supplemented with 8uL of PolyAcryl carrier. PolyAcryl Carrier was used to enhance RNA recovery from such small starting materials. Remainder of procedure followed manufacturer’s protocol. RNA was resuspended in 20uL of 0.1% DEPC-H2O and spec’d on a NandoDrop1000. As can be seen by the absorbance spectrum plots (top image), there is clear phenol contamination (indicated by shift of absorbance peak to 270nm, instead of the peak being at 260nm). Additionally, there’re large peaks at 230nm in each of the two samples, suggesting other contamination (high residual salts, ethanol?). Additionally, the 260/280 ratios are subpar for RNA quality (i.e. <1.9). However, these ratios could be skewed by the the residual phenol present in both samples. I may perform an ethanol precipitation on these just to see if I can get them cleaned up. Yields for both samples are very promising. This entry was posted in Sea star RNA-seq and tagged coelomycete, P10, P18, Pycnopodia helianthoides, RNA, RNA isolation, RNA quantification, RNAlater, sea star, TriReagent on 1 April, 2014 by kubu4.